Crowcon – a world leader in portable and fixed gas detection instruments – announces that the Gas-Pro and T4 multi-gas detectors now enable vessels to comply with the SOLAS X1-1/7 directive, which becomes effective on 1st July 2016. Both detectors are also approved by the Marine Equipment Directive (MED). The imminent SOLAS X1-1/7 directive requires all EU-registered vessels with a gross tonnage of over 500 tonnes to carry one or more gas detectors for the remote monitoring of hazardous gases prior to entry into an enclosed space. The gases covered by this regulation are: oxygen (O2), flammable gas, hydrogen sulphide (H2S) and carbon monoxide (CO). Crowcon’s compact Gas-Pro detectors can monitor the presence of up to five different gases, including all of the gases mandated by the SOLAS X1-1/7 directive. The detectors use an integrated pump which enables the atmosphere inside an enclosed space to be sampled and tested prior to entry. The T4 detector used with a manual aspirator provides an excellent alternative solution for sampling atmospheres in enclosed spaces. This lightweight unit and a robust housing which can withstand drop-testing from up to 4 metres is ideal for use aboard a ship. The 24 hour battery life ensures extended periods of use before recharging is required. Both the Gas-Pro and T4 detectors are equipped with Crowcon’s Positive Safety traffic-light status indicator which allows your units’ compliance status to be instantly confirmed. As well as being their suitability for enclosed space entry checks, both devices are also designed for use as personal gas detectors. To comply with the SOLAS requirement that two monthly safety drills include checking and using atmospheric measuring devices, test gas is all that is required to test Gas-Pro and T4, which log the test and result. Alternatively, Crowcon’s I-Test bump-test and calibration station allows bump testing and calibration to be performed with minimal training, and provides an audit trail of the time and result of each safety check. I-Test is available for Gas-Pro and T4. “According to the Marine Accident Investigation Branch (MAIB), accidents in enclosed spaces continue to be one of the most common causes of work-related fatalities on-board ships,” explains Nick Dajda, Portable Products Business Development Manager, Crowcon. 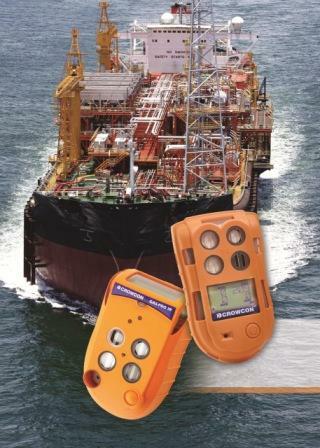 “Crowcon’s Gas-Pro and T4 gas detectors meet all of the requirements for ensuring the safety of personnel who are about to enter, or are working in enclosed spaces, and are fully compliant with the Marine Equipment Directive.” In addition to Gas-Pro and T4 detectors, Crowcon’s Gasman, Tetra and Tetra 3 portable gas detectors are also fully compliant with the MED.